TACF’s Pure American Program: Seedlings Available Soon! From the American Chestnut Foundation January 2017 eSprout Newsletter. Interested in growing chestnuts? This unique program is an easy and affordable way to learn the ‘ins-and-outs’ of growing American chestnuts. Supplies are limited so be ready to place your order beginning February 1 for these pure American chestnut seedlings. Pricing information and ordering instructions are available on our website. Last day to order is March 31. Phone orders only, please (828-281-0047). 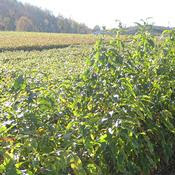 Pure American chestnut seedlings are available to current TACF members ONLY. Not a current member? If not, you may join when placing your seedling order ($40 minimum donation). DISCLAIMER: Pure American chestnut seedlings are not part of the TACF backcross breeding program and they are not blight-resistant. The Fall 2015 edition of The Bur, the Virginia Chapter’s newsletter, is now available on their web site. American Chestnut burs contain the nuts until they ripen. This edition of the newsletter includes an update on the Virginia TACF Breeding Program which has made great progress in restoring the American Chestnut to Virginia. It also describes the Learning Box Grant program which will donate four American Chestnut learning boxes to the Virginia Master Naturalist program. These learning boxes will be used to educate new and current VMN volunteers so that VMN volunteers can take them to outreach events to extend the learning box experience to others.